1. 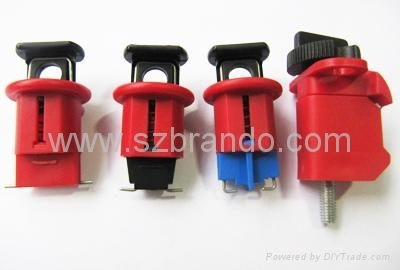 Material: Glass-Filled nylon, can be used to open circuit breaker or close circuit breaker. 2. Fit most existing types of European and Asian circuit breakers. 4. Easily installed with the aid of a push button. 5. Can take padlocks with a shackle diameter up to 7mm. 6. Available for single and multi-pole breakers. 7. We have tested 750 types of circuit breakers and our MCB lockouts fit most of all. 8. Related MCB lockouts: BO-D02(Pin in Standard), BO-D03(Tie Bar Lockout), BO-D04(Pin Out Wide), etc.